The Coco Hideaway toy is made for the smaller parrots: Budgies (parakeets), Lovebirds, Parrotlets, and even finches and canaries. Although bigger species like a Cockatiel could certainly enjoy the coconut and wood ladder, their long tail and would not fit inside the coconut itself. Not all birds will be interested in going inside the coconut anyway. Whether it’s used as a “hideaway” as the name suggests, or just as a fun, natural toy to stand on and chew will depend on your parrot! Approximate size: 5.5″ x 12″. 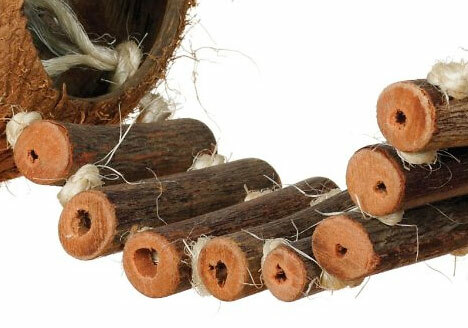 The size of the coconut will vary slightly between each toy as it is completely natural and a REAL coconut. Likewise, the opening of the coconut will naturally vary between products as well, and no one toy will be exactly the same as the next. But the average size people have reported is around 2.5 – 2.75 inches wide. The length of the ladder can also vary, with some people reporting one or two less pieces of wood steps compared to the photo but this seems to be a rare occurrence. Prevue Pet Products is an established, respected pet product design and manufacturing company who pride themselves on quality and safety. 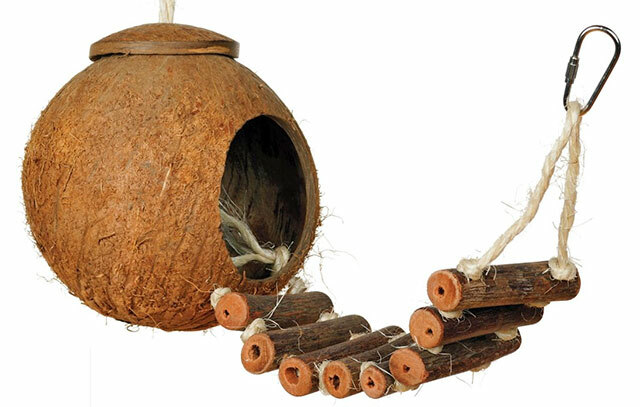 They have certainly come up with some very original, uniquely designed toys for parrots and this Coconut Hideaway is no exception. 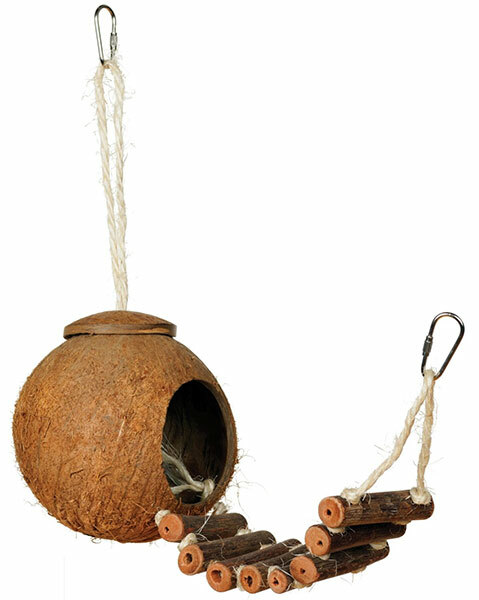 This is part of the Naturals line of bird toys which, as you’d guess, makes use of all natural and eco-friendly materials like coconut, wood, bamboo and plant fibers. They are also hand made. As with all toys, supervision and daily checks and maintenance of all bird toys is very important. If your bird is prone to swallowing fiber, keep close supervision while he or she is using it. Even though sisal is safe, ingesting any sort of fiber in moderate to large quantities can cause crop or intestinal blockages – which requires immediate veterinary attention. As with all bird toys, this one should be inspected everyday to make sure it’s in safe condition. Parrots should be supervised when using toys, and any damage, wear, or dangerous fraying needs to be fixed or removed daily. This toy almost takes you to a tropical island – it’s truly exotic in its design and materials.